The collaboration between local developer Lumayan Indah Sdn Bhd and Singapore-based Banyan Tree Holdings Ltd will see the opening of the luxurious Banyan Tree Signatures Pavilion Kuala Lumpur hotel in 2016. The Banyan Tree Signatures Pavilion Kuala Lumpur project with a gross development value (GDV) of RM1.4bil comprises a 55-storey block of 441 private residences, 51 service residences, and 50 hotel suites. It is located on 1.46 acres at the junction of Jalan Conlay and Jalan Raja Chulan, and is scheduled for completion in 2015. The Banyan Tree Phuket is the flagship property of the Banyan Tree Group, known for its high standards. According to 1 Pavilion Property sales and marketing director Tracey Lai, buyers draw comfort and confidence from the brand collaboration of Banyan Tree, a respected global hotel brand and Pavilion, an iconic award winning premier shopping mall. Banyan Tree, listed on the Singapore Stock Exchange, is a leading manager and developer of premium resorts, hotels and spas around the world. Lai says Banyan Tree will operate the 50 hotel suites and manage the private and service residences, while 1 Pavilion Property Consultancy Sdn Bhd is the sales and marketing consultant of the Banyan Tree Signatures private residences. “With this collaboration, the Banyan Tree trademark can be used to promote, market and sell the Banyan Tree Private Residences. Since the sales preview of the project in July, the response has been good with a take up rate of 80% mainly from local buyers,” Lai discloses. With average sizes of 1,076 sq ft to 2,174 sq ft, the residences are priced at an average RM2,000 per sq ft, with vacant possession of the residences in 2015. 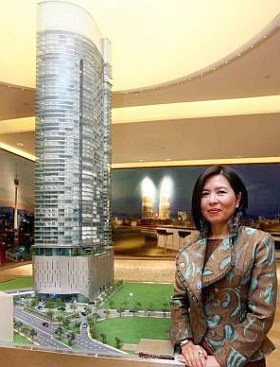 At 55 stories, she says the project will be one of the tallest residential buildings in the country, and a private link bridge to the Pavilion Kuala Lumpur shopping mall allows exclusive access to the mall. Banyan Tree executive chairman Ho Kwon Ping hopes the company's entry in Kuala Lumpur's hospitality market will pave the way for more hospitality projects in Malaysia. “We are on the look out for other opportunities in East and West Malaysia, and hope to be able to make some announcements in due course,” he discloses to StarBizWeek in an email response. Ho says Banyan Tree typically opts for stunning locations and also gateway cities for its resorts, with the hope of creating unforgettable holiday and travel experiences for its guests. “Banyan Tree Signatures Pavilion Kuala Lumpur will be a new and innovative product concept offering a suite of diverse and complementary facilities and services spa, a retail gallery and a destination roof-top restaurant anchored by an iconic hotel and primary luxury residences. “We look to offer a holistic lifestyle encompassing dining, shopping and relaxation delivered with the signature Banyan Tree service standards,” he explains. On its expansion plans, Ho says there will be more hotels and resorts, integrated resorts, as well as property development projects where appropriate. Ho believes Banyan Tree's pioneering and can-do spirit has steered the company to many uncharted territories to earn its place as one of the industry leaders. The group's first resort Banyan Tree Phuket, which opened in 1994, was the result of the successful rehabilitation of an abandoned tin mine in Laguna Phuket. 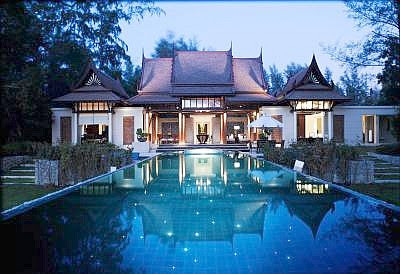 Today, Banyan Tree has over 30 hotels and resorts, close to 70 spas and 80 retail galleries and two golf courses. As of end-2010, the total equity value of its investments around the world is in the region of US$1bil net of any debt. The net asset value of Banyan Tree Holdings is around US$540mil and the total cash equity in the two Banyan Tree Hospitality Funds (for Indochina and China) is around US$450mil. Ho discloses that Banyan Tree has around 30 projects in the pipeline and singles out China as the strongest growth region. It has a strong presence and pipeline of projects in China. “Given the general economic climate in the world, our investments in the core regions of the Asia Pacific, including China, are performing reasonably well. Much of the downturn in our traditional European and Japanese markets has been mitigated by strong performance from China, where our brand is strong. We have around 10 marketing offices in China now,” he adds. Ho says growth in the Asia Pacific is still quite stable and the new markets for the company include Vietnam, the Indian Ocean and India. “We are looking to double our properties by 2015, and will be opening five to six hotels a year. This year alone, we opened Banyan Tree Macau, our newest and latest urban resort, and soon to be opened will be Angsana Hangzhou, our second resort in that city; Angsana Balaclava, our first property in Mauritius, as well as Angsana Laguna Phuket, our flagship Angsana property on the island with more than 400 rooms/suites, and exciting facilities for families, meetings and holiday makers,” Ho discloses. Meanwhile, specific properties have been affected by local conditions such as Bangkok which was hit by riots last year and floods this year. As for Europe, he says although the region is suffering the worst recession in many years, there are still opportunities to be found. To tap on opportunities when they arise, Banyan Tree has established an operational, business development, and marketing office in London. Among its innovations include the all pool-villa concept, with the birth of Banyan Tree Phuket 17 years ago; the tropical garden spa concept; and being one of the largest spa operators in the world with its own Spa Academy that provides therapists with no less than 350 hours of training. At its urban resorts of Banyan Tree Seoul and Banyan Tree Macau, relaxation pools are installed in every suites. The recently opened Banyan Tree Spa in Singapore, located on level 55 of Marina Bay Sands, features the concept of “an oasis in the sky” with therapists offering treatments that are signature to the Banyan Tree Spa experience. Ho says Banyan Tree is also a strong supporter of corporate social responsibility initiatives and believes in working with and giving back to the community. “We believe in a sense of culture and place, and I am interested in how our resorts can be an impetus for social-cultural and economic change for the local people,” he adds. Kuala Lumpur CBRE Global Investors, which has a portfolio of US$5 billion (RM15.8 billion) invested in Asian real estate, aims to raise and invest another US$5 billion in the region within three to five years. "We're looking to double the size of our Asian business," said Asia chief executive Richard Price in an interview yesterday. "I think it's an achievable goal." The company will invest the money in China, Indonesia, Japan, South Korea, Malaysia and Singapore, Price said, favouring retail property in markets such as China and Southeast Asia, where greater consumer spending power is supporting shopping centre development. Japan is CBRE Global's biggest market in Asia, with US$2 billion invested in office buildings, residential property, shops and industrial space. Although Japanese investment property was the worst performer in Asia last year, with a gain of just 0.1 per cent according to property market tracker Investment Property Databank, large investors now consider it a safer market at a time many others are seeing prices fall. "We think cyclically Japan looks interesting again for income-focused investors," Price said. "It's close to the bottom of the trough for Tokyo rental prices. The impact of the earthquake has made a lot of older (office) stock obsolete and is causing a real flight to quality," he added. 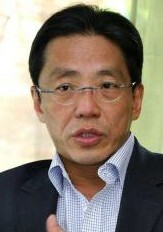 China would be another key focus, Price said, and should account for 20 per cent of the portfolio, or US$2 billion. The company has invested US$1 billion over the years in China, but only has an equity of about US$300 million because it has invested mainly in residential projects via joint venture partners who have sold off apartments as they built them. Those projects have seen it collaborate with some of the country's largest developers, including China Vanke Co Ltd and Longfor Properties Co Ltd.
Los Angeles-based CBRE Group Inc took over the bulk of the property business of Dutch company ING Groep NV in a US$1 billion deal that closed on October 4 for its Asian assets and on November 1 for its business in Europe. That gave the company US$95 billion in assets under management at the end of September. On Oct 31 the world's population surpassed the seven-billion mark. We have reached a significant milestone, but there was no cause for celebration. As the population grows, so does the need for more food and shelter. This will put more pressure on available resources. It is only by adopting a culture of sustainability that we can ensure the future of our children is not compromised. Just like in any other industry, the building sector will have to adopt new approaches that take into consideration the need to protect the environment and ensure sustainable development. I am pleased to note that builders are already taking the first steps in that direction. The industry is already taking a serious view of “green building”. The term refers to an environmentally-responsible process that covers the entire life-cycle of a building, from siting, design, construction, operation and maintenance to renovation and even demolition. Similar steps are being taken by builders in Malaysia. Efforts made by industry players, who have become more conscious of the need for sustainable development, have helped to put in place various guidelines to ensure new properties are developed using a more environmentally-friendly process. For the industry, there is the Green Building Index (GBI), which was introduced in 2009 to assess and accredit a development along sustainable or “green” criteria. The Government had, in its Budget 2010, even given priority to the procurement of goods and services that are environmentally friendly. One of the most pertinent objectives of the GBI environmental rating system is to transform the built environment to reduce its impact on its surroundings. Its other objectives include ensuring that new buildings remain relevant in the future and existing buildings are refurbished and upgraded properly to remain relevant. Under the GBI, buildings are rated based on six criteria energy efficiency, indoor environment quality, sustainable site planning and management, materials and resources, water efficiency as well as innovation. More recently, the government has taken this initiative another step further by requiring that builders of commercial buildings now ensure that their projects meet GBI standards. At the same time, owners of bungalow and semi-detached residential units are required to put in place a system for harvesting rain water. These are baby steps, yet, but they certainly show that there now is a desire in the industry as well as the government to ensure a more sustainable future for the benefit of the next generation. The bottom line is that whatever we build now to provide a roof over our heads, it must not only not have a negative impact on the environment, it must also be able to enhance our surroundings and ensure we have a better quality of life. While the environmental benefits of such efforts may not be immediately visible, they can also have a positive effect on corporate image, as well as the rental and resale value of buildings. The BGI is based on Singapore's Building and Construction Authority (BCA) Green Mark that incorporates internationally recognised best practices in environmental design and performance. Among the benefits of the BCA Green Mark are reduction in water and energy bills, reduction in potential environmental impact, improvement of indoor environmental quality for a healthy and productive workplace and clear direction for continual improvement. However, like most things, efforts towards sustainable development come at a cost. In some areas, the additional cost may be low enough to be manageable, but in other areas, it may seem exceedingly high. For instance, an apartment designed with large doors and windows will be more airy and thus require less energy to keep its interior cool. At the same time, it will not require a hefty increase in costs. However, in other areas, ensuring sustainability could add substantially to the cost of development. For instance, builders could ensure that production methods of the materials used in their projects are also environmentally friendly. But that would entail verifying the entire supply chain for sustainability, and that may turn out to be a costly exercise. At the same time, the returns from such efforts may still not be attractive enough for many of us. It has been estimated that even the most basic efforts at ensuring sustainability could add 5% to 6% to the building cost. In some cases, the cost could rise by up to 15%. Even if such efforts eventually result in savings in energy use, it could take 15 to 20 years before such savings actually begin to offset the additional costs that have to be incurred initially. And that is only the ringgit and sen part of it. There are other costs too. To illustrate, let us take a look at the compact fluorescent bulb or “green” bulb. It uses 75% less energy than a traditional incandescent bulb but it also contains mercury that, if not disposed of properly, could cause contamination in the environment. Builders will be hard-pressed to keep costs down and ensure sustainability in the procurement of raw materials and construction process at the same time. It, after all, does not make good business sense to build something that people are not prepared to pay for. One would be tempted to argue for a balance between sustainability efforts and managing the costs. Strictly speaking, that would mean compromising on the need to ensure sustainability so we can save some money, and that's certainly not a long-term solution. Perhaps a more comprehensive and concerted joint effort by the industry and government could be a start. The Klang Valley has grown tremendously in many fronts, both organically from a natural increase in the local population, inter-state migration, and more robust economic and development activities. There is also a higher influx of foreigners to our shores in the last one to two years. Looking at the rapid pace of change and development around us, I believe the gravitational centre of the Klang Valley needs to be shifted from the present mostly developed and rather congested cities, especially Kuala Lumpur and Petaling Jaya, to more well spaced out and uncrowded areas. With quite a number of high impact and transformational projects in the pipeline for implementation, the availability of land will be able to accommodate the big infrastructure and development projects without having to encroach into our present living landscape. One of the ways this can be done is by ensuring that high impact development projects that have the potential to spawn new economic activities and attract people to set up homes and businesses should be spread out to corridors which are still relatively untapped and inhibited. As we know the ongoing development of new infrastructure and property projects is mainly concentrated in the central and southern corridors that include Kuala Lumpur, Petaling Jaya, Puchong, Cyberjaya, Putrajaya, right down to Nilai in Negri Sembilan. The western corridor towards the Port Klang area is also seeing greater growth and development. Meanwhile the northern and eastern corridors are still relatively untapped and efforts should be expended to bring more “enabling” projects to those parts of the Klang Valley. Unlike some countries where land is a rare commodity, Malaysia is blessed with vast tracts of land that are suitable for development, and the question that has been asked many times is this: Why is there land shortage as well as inflated land cost and property prices in the country then? Rightly speaking, there should not be any land or property shortage if more land is opened up for development and developers continue to launch township products that include landed properties that are in short supply. Many of us must have noticed that the number of new greenfield township projects has quite suddenly grounded to a halt in the past three years, as most developers have shifted their focus to building small niche projects instead. In a way, this has tremendously reduced the supply of property, especially landed housing units, over the past two years. One of the plausible ways to address the current land and property shortage is to “plant the seeds of development” by spreading out some of the high impact government projects in the undeveloped corridors as catalyst of change and development. Infrastructure projects such as new highways, and good public transport system such as the mass rapid transit or bullet train project, are some of the initiatives that can spawn wider growth corridors. Besides the natural “organic” pace of development, efforts to expedite the development process of the cities in the Klang Valley include high impact infrastructure projects, such as the My Rapid Transit (MRT) project. The MRT is one of the biggest infrastructure projects that has been planned for the country to act as the backbone of the Klang Valley's public transport system. To ensure that it serves its purpose well into decades to come, it is imperative for the project planners to plan the project not just to cater to the needs of the present population but more importantly, the needs of the growing Klang Valley populace in many years to come. The question is whether it should just concentrate on the well populated and busy areas or that is should also ply the other sparsely populated areas. Instead of building most of the rail tracks and stations in the “already occupied” and developed parts of the city, I believe the MRT should also traverse through the less occupied corridors of the Klang Valley to spread development there. That way it will have more greenfield land and flexibility to master plan for a more holistic and integrated MRT network, with the necessary ancillary supporting structures such as the terminals and car parks, to promote a higher use of the public transport system. Although in terms of capacity, it may be under utilise initially, its usage is bound to pick up steam once more economic activities start to take shape and the population starts to grow. When demand increases, new land will bound to be opened and developers will find it feasible to undertake big township projects again. With higher supply, prices will also be back to its lower equilibrium. Deputy news editor Angie Ng has an advice for those who have misgivings of not having more: Count our blessings and reach out to help the less fortunate.